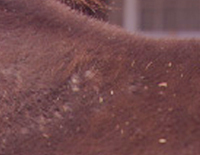 Here's how to recognize and treat some common equine winter skin conditions. Winter can be rough on your horse's skin. Moisture from rain and snow encourages bacteria and other pathogens to grow. And thick winter coats---plus layers of blankets---can allow conditions to go unnoticed for days or even weeks as they worsen. Treating established skin problems can be difficult when bathing isn't an option. Your best bet for keeping your horse's skin in good shape this winter is watching out for the conditions most likely to develop so you can begin treatment as early as possible. Scratches. One of the easiest skin problems to identify and treat, scratches is a bacterial infection affecting the skin at a horse's pastern. The bacteria take hold when repeated exposure to wet conditions strips away the skin's protective oils, causing chapping and cracking. The earliest sign of scratches is formation of a crust on the back of the pastern, so do an inspection daily as you pick out your horse's hooves. If you see signs of scratches, wash the affected area with an anti-bacterial shampoo, then rinse and dry it completely. Drying the area is extremely important and will probably require a hair dryer in winter months. Finally, trim the longer pastern hairs and slather the area with an antibiotic ointment followed by a layer of Desitin or ich-tham-mol to provide a barrier to further moisture. (If it's too cold to wash the leg, skip directly to the trimming and ointment steps.) Avoid picking off tightly attached scabs because that can be painful to the horse. Instead, use a clean cloth to wipe the ointment from the leg every other day. The softened crusts will slide off easily. Then reapply the ointment. Rainrot. The bacterium that causes rainrot, Dermatophilus congolensis, normally lives on the skin with no adverse effects. However, a rain followed by humid conditions can allow the bacteria to multiply and irritate hair follicles, leading to painful crusting and hair loss on the top of the rump and along "runoff" lines of the flanks. Older horses and those with compromised immune systems are most likely to develop rainrot. The earliest signs are ruffled-looking patches of coat---caused by hair follicles standing on end slightly---combined with warm and possibly sensitive skin. A daily grooming session or at least a peek under the blankets is necessary to notice these changes. A course of anti-biotics at the earliest stages can head off rainrot, so consider calling your veterinarian if you see signs of the condition. If scabs have already developed and bathing isn't possible, slather the spots with mineral oil to loosen the crusts and allow them to slide off easily. With the scabs gone, you can treat the bacteria beneath them with an antiseptic wash. When the weather warms up, a full bath with a medicated, antidandruff shampoo followed by a long spell in the warm sun will help clear up rain rot. This article is copyrighted and first appeared in EQUUS Magazine. It is reprinted here by permission.